Our Licensed and Insured Plumbers will arrive at your location as soon as the possibly can. Our state of the art Camera System is capable of reaching up to 200 feet from the monitor. If your problem is in your main sewer line or laundry drain line, Our camera system can fit to any size pipe. From residential camera inspection to commercial camera inspection, trust the experts at Texas Premier Plumbing to find the problem. Upon arriving to your location our plumbers will inspect the line and determine which location is best for your camera inspection. After finding the location for the camera inspection, our plumbers will insert the camera down the line and will be able to show you on a color 14″ monitor exactly where the problem is in you line. Our camera inspection service can also include locating above ground the place where you line is broken or clogged. 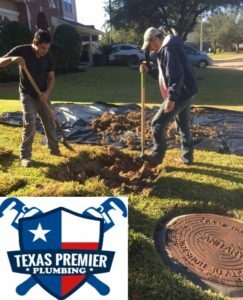 Texas Premier Plumbing experts will guide you throughout the process and will be happy to answer any questions you may have. Why You May Need A Camera Inspections? Texas Premier Plumbing’s Camera inspection service is non-invasive, accurate, and cost-efficient. Our fiber optic camera inspection service is requested for a variety of reasons. Under Slab Leaks: Leaks under you slab can cause great damage to your home or business. Aside from the water cost it could cost thousands to fix foundation and other repair. Inspecting New Homes: If you are in the market for a new home and you want to make sure you won’t have major plumbing problems from a previous owner. A Camera Inspection of your potential home could save money and headaches. Retrieving Your Lost Items: When you lost an item that was sentimental or valuable down the drain and it seem hopeless. 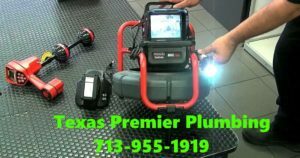 Texas Premier Plumbing Camera System can help you save time and money in locating your missing items. Clog Drain: Texas Premier Plumbing Camera Inspections allow you to find the exact spot of your clog. That will help you decide if your need a Drain cleaning service, a Hydro Jett drain cleaning service or even major repair. Texas Premier Plumbing Camera System inspection services are the easiest way to prevent future emergencies and determine the cause and location of present plumbing problems. One of the worst problems that a house owner can have is Sewer blocks . When you have a clogs in the drain pipes it may require digging up the lawn or breaking down the concrete slab for a repair. This type of service is labor intensive process and very expansive as well. One of the great benefits of a Camera Inspection is to solved the problem. Texas Premier Plumbing’s Camera Inspection equipment can preform a sewer inspection to locate any blocks or root infiltrations in your sewer line. Our fiber optic Camera Inspection equipment is consists of a remotely operated swiveling head that can pan and tilt. At the head of the Camera a LED light illuminate the sewer lines. Texas Premier Plumbing’s waterproof camera system allows us to save you time, money, addressing your plumbing problem. Our Plumbers can identify the problems that need to be addressed with repairs or maintenance and easily solve them!. If you are experiencing plumbing problems, call Texas Premier Plumbing licensed plumbing experts for quick diagnosis and innovative plumbing solutions. Texas Premier Plumbing Camera Inspection Service.